Today, I will tell you about another way to measure the tides, from the rotation of Mercury. For this, I will present you a study entitled Periodic and quasi-periodic attractors for the spin-orbit evolution of Mercury with a realistic tidal torque, which was recently published in The Monthly Notices of the Royal Astronomical Society. This is a collaboration between English and Italian mathematicians, i.e. Michele Bartuccelli, Jonathan Deane, and Guido Gentile. In planetary sciences mathematics can lead to new discoveries. In this case, the idea is: tides slow down the rotation of a planetary body, which eventually reaches an equilibrium rotation (or spin). 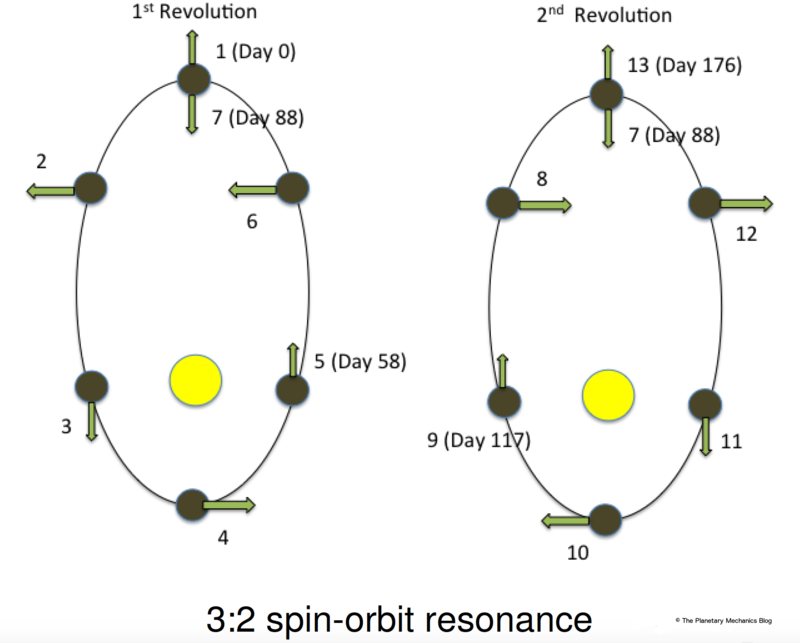 For the Moon, the equilibrium is the synchronous rotation, while for Mercury it is the 3:2 spin-orbit resonance. Very well. A very good way to describe this final state is to describe the equilibrium rotation, i.e. in considering that the tides do not affect the spin anymore. But this is just an approximation. The tides are actually still active, and they affect the final state. In considering it, the authors show that the variations of the spin rate of Mercury should be composed of at least two sinusoids, i.e. two periodic effects, the superimposition of these two periods being quasi-periodic… you now understand the title. I have already presented you Mercury here. Mercury is the innermost planet of the Solar System, with a semimajor axis which is about one third of the one of the Earth, i.e. some 58 million km, and a surprisingly large orbital eccentricity, which is 0.206. These two elements favor a spin-orbit resonance, i.e. the rotation rate of Mercury is commensurate with its orbital rate. Their ratio is 3/2, Mercury performing a revolution about the Sun in 88 days, while a rotation period is 58 days. You can notice a 3/2 ratio between these two numbers. Why is this configuration possible as an equilibrium state? If you neglect the dissipation (the authors do not) and the obliquity (the authors do, and they are probably right to do it), you can write down a second-degree ODE (ordinary differential equation), which rules the spin. In this equation, the triaxiality of Mercury plays a major role, i.e. Mercury spins the way it spins because it is triaxial. Another reason is its orbital eccentricity. This ODE has equilibriums, i.e. stable spin rates, among them is the 3:2 spin-orbit resonance. And what about the obliquity? It is actually an equilibrium as well, known as Cassini State 1, in which the angular momentum of Mercury is tilted from the normal to its orbit by 2 arcminutes. This tilt is a response to the slow precessing motion (period: 300,000 years) of the orbit of Mercury around the Sun. Let us forget the obliquity. There are several possible spin-orbit ratios for Mercury. If you went back to the ODE which rules the spin-rate of Mercury, you would see that there are actually several equilibrium spin rates, which correspond to p/2 spin-orbit resonances, p being an integer. Among them are the famous synchronous resonance 1:1 (p=2), the present resonance of Mercury (p=3), and other ones, which have never been observed yet. And what if Mercury had been initially retrograde? Why not? Venus is retrograde… In that case, the tides would have accelerated Mercury, which would have been trapped in the synchronous resonance, which is the strongest one. This would mean that this synchronous resonance would have been destabilized, to allow trapping into the 3:2 resonance. Any worthwhile scenario of the spin evolution of Mercury must end up in the 3:2 resonance, since it is the current state. The scenario of an initially retrograde Mercury has been proposed to explain the hemispheric repartition of the observed impacts, which could be a signature of a past synchronous rotation. Could be, but is not necessarily. Another explanation is that the geophysical activity of Mercury would have renewed the surface of only one hemisphere, making the craters visible only on the other part. Anyway, whatever the past of Mercury, it needed a dissipative process to end up in an equilibrium state. This dissipative process is the tides, assisted or not by core-mantle friction. Because of the differential attraction of the Sun on Mercury, you have internal friction, i.e. stress and strains, which dissipate energy, and slow down the rotation. This dissipation is enforced by the orbital eccentricity (0.206), which induces periodic variations of the Sun-Mercury distance. An interesting question is: how does the material constituting Mercury react to the tides? A critical parameter is the tidal frequency, i.e. the way you dissipates depends on the frequency you shake. A derivation of the tidal torque raised by the Sun proves to be a sum of periodic excitations, one of them being dominant in the vicinity of a resonance. This results in an enforcement of all the spin-orbit resonances, which means that a proper tidal model is critical for accurate simulations of the spin evolution. A pretty common way to model the tides is the Maxwell model: you define a Maxwell time, which is to be compared with the period of the tidal excitation (the shaking). If your excitation is slow enough, then you will have an elastic deformation, i.e. Mercury will have the ability to recover its shape without loss of energy. However, a more rapid excitation will be dissipative. Then this model can be improved, or refined, in considering more dissipation at high frequencies (Andrade model), or grain-boundary slip (Burgers model)… There are several models in the literature, which are supported by theoretical considerations and lab experiments. Choosing the appropriate one depends on the material you consider, under which conditions, i.e. pressure and temperature, and the excitation frequencies. But in any case, these physically realistic tidal models will enforce the spin-orbit resonances. Considering only the tides assumes that your body is (almost) homogeneous. Mercury has actually an at least partially molten outer core, i.e. a global fluid layer somewhere in its interior. This induces fluid-solid boundaries, the outer one being called CMB, for core-mantle boundary, and you can have friction there. 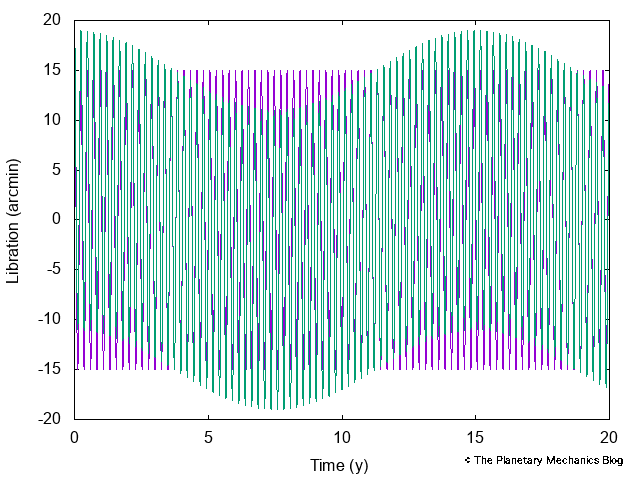 The authors assumed that the CMB was formed after the trapping of Mercury into its present 3:2 spin-orbit resonance, which is supported by some studies. This is why they neglected the core-mantle friction. In this specific paper, they write down the ODE ruling the dynamics in considering the frequency-dependent tides (which they call realistic), and solve it analytically with a perturbation method, i.e. first in neglecting a perturbation, that they add incrementally, to eventually converge to the real solution. They checked their results with numerical integrations, and they also studied the stability of the solutions (the stable solutions being attractors), and the probabilities of capture. In my opinion, the main result is: the stable attractor is not periodic but quasi-periodic. Fine, but what does that mean? If we neglect the influence of the other planets, then the variations of the spin rate of Mercury is expected to be a periodic signal, with a period of 88 days. This is due to the periodic variations of the Sun-Mercury distance, because of the eccentricity. This results in longitudinal librations, which are analogous to the librations of the Moon (we do not see 50% of the surface of the Moon, but 59%, thanks to these librations). The authors say that this solution is not stable. However, a stable solution is the superimposition of these librations with a sinusoid, which period is close to 15 years, and an amplitude of a few arcminutes (to be compared to 15 arcminutes, which is the expected amplitude of the 88-d signal). So, it is not negligible, and this 15-y period is the one of the free (or proper) oscillations of Mercury. A pendulum has a natural frequency of oscillations, here this is exactly the same. But contrarily to a pendulum, the amplitude of these oscillations does not tend to 0. So, we could hope to detect it, which would be a direct observation of the tidal dissipation. What can we observe? We should first keep in mind that the authors addressed the early Mercury, when being trapped into the 3:2 spin-orbit resonance, which was pretty homogeneous. The current Mercury has a global fluid layer, which means a larger (about twice) amplitude of the 88-d signal, and a different dissipative process, the tides being assisted by core-mantle friction. As a consequence, there is no guarantee that the 15-y oscillation (actually a little shorter, some 12 years, because of the fluid core) would still exist, and that would require a dedicated study. But measuring it would be an information anyway. How to measure it? The first observations of the rotation of Mercury in 1965 and of the librations in 2007 were Earth-based, radar observations, which are sensitive to the velocity. This means that they are more likely to detect a rapid oscillation (88 d, e.g.) than a slow one (12 years…). Observations of the surface of Mercury by the spacecraft MESSENGER confirmed those measurements. In 2018 the ESA/JAXA (Europe / Japan) joint mission Bepi-Colombo will be sent to Mercury, for orbital insertion in 2025 and hopefully a 2-y mission, with a better accuracy than MESSENGER. So, we could hope a refinement of the measurements of the longitudinal motion. Purple: The 88-d oscillation. Green: Superimposed with the 15-y one. Keep in mind that Bepi-Colombo will orbit Mercury during some 2 years. The study, made freely available by the authors on arXiv and on the portal of the University of Surrey, thanks to them for sharing! The web page of Michele Bartuccelli. The web page of Jonathan Deane. The web page of Guido Gentile.